Would it surprise you to learn a sixth mass extinction is underway? How about Earth’s species disappearing 15-100 times faster than the normal rate between previous mass extinctions? 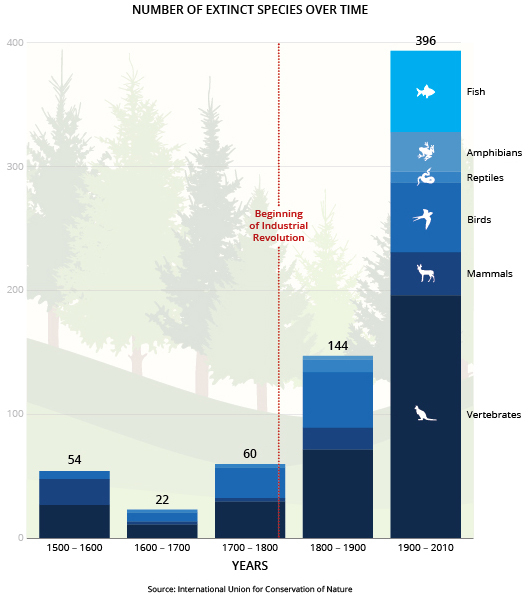 Knowing, not since dinosaur’s swan song has Earth witnessed such rapid eradication of species? A study published June 19, 2015 in the Journal Science Advances demands a little pondering. Scientists from Berkeley, Princeton, Stanford, University of Florida, and Universidad Autonoma de Mexico called for immediate action to conserve threatened species, warning the window of opportunity is closing fast. If it is allowed to continue, life would take many millions of years to recover, and our species itself would likely disappear early on. Using fossil records and extinction counts from a range of records, the researchers compared a highly conservative estimate of current extinctions with a background rate estimate twice as high as those widely used in previous analyses. We emphasize that our calculations very likely underestimate the severity of the extinction crisis, because our aim was to place a realistic lower bound on humanity’s impact on biodiversity. [The study] shows without any significant doubt that we are now entering the sixth great mass extinction event.